In the past few months, I have been contacted by various members of the media, and organizations wishing to speak further about Christian Science I felt it was time to create a Media Resources page to streamline this process. Thank you for your interest in kindism.org. I do NOT do TV appearances, lectures, talks, or phone interviews. The only way to reach me is via e-mail (or the embedded contact forms on this blog). 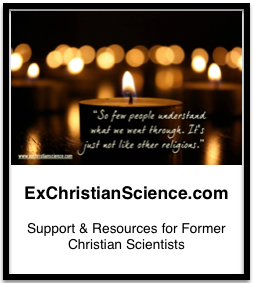 If you would like further information about Christian Science and Leaving Christian Science, please visit the Resources page and pages in the Resources drop-down menu. If you have specific questions about kindism.org or my journey out of Christian Science, please visit the Questions page and read the blog (and not just the most recent entries) before e-mailing. If you would like to get in touch with other former Christian Scientists in the hopes they will speak with you, I suggest you visit exchristianscience.com. Where am I located? Probably not near where you are.